Choosing the right crate for you and your dog is no easy task with so many styles and sizes available. So we at Labrador Training HQ have done the research for you! In a previous post, we provided a guide to dog crate sizes and discuss the pros and cons of various types to make sure you choose the right size and style. In this post, we've selected from Amazon the most highly rated crates with the best customer feedback, while keeping a keen eye on price and value. 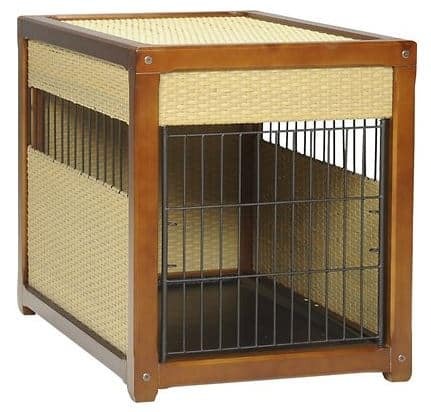 Below you can see a selection of the best dog crates available, in many different styles to suit different purposes. Each one has been carefully hand-picked to ensure they are the right size, of good quality, practical for their intended use, have received exceptional feedback from previous buyers and offer good value for money. And the good thing about buying from Amazon is the competition there with so many sellers means they fight for your custom and often you can find some exceptionally good, competitive prices! Note: The links above take you to more information, current prices and customer reviews on Chewy and Amazon. 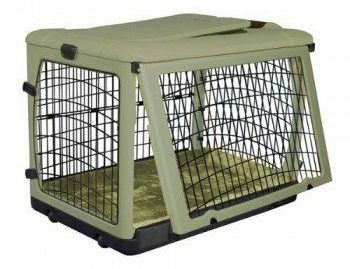 Soft-Sided Fold Away Travel Crates For Dogs On The Go! Whichever Crate You Choose, Make It Comfortable! This first crate is a 'crate for life' and offers the best value: You buy a crate to suit your dog when fully grown, then use the supplied divider to resize it to suit your young and growing puppy. A 42" crate is suitable for an adult Lab, a range of sizes are available for other breeds by clicking the link for more info. 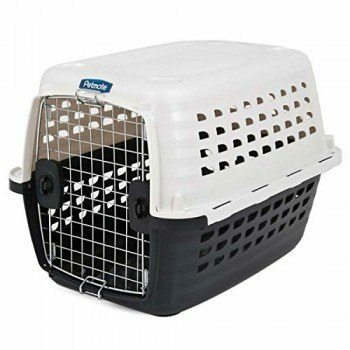 Comes with a removable, tough ABS plastic tray which makes keeping the crate clean a breeze. It's very easy to set up with no tools needed and can be folded down in seconds for ease of portability. It has a protective, black, electro-coating to make it easy clean, corrosion resistant and a little more stylish looking that some bare metal rivals. Finally, it comes with highly secure slide bolt catches and has no sharp edges so is built with safety and security in mind. The mix of great features, attention to safety and bargain pricing of this crate mean that - in our opinion - it is incredibly hard to find better value! 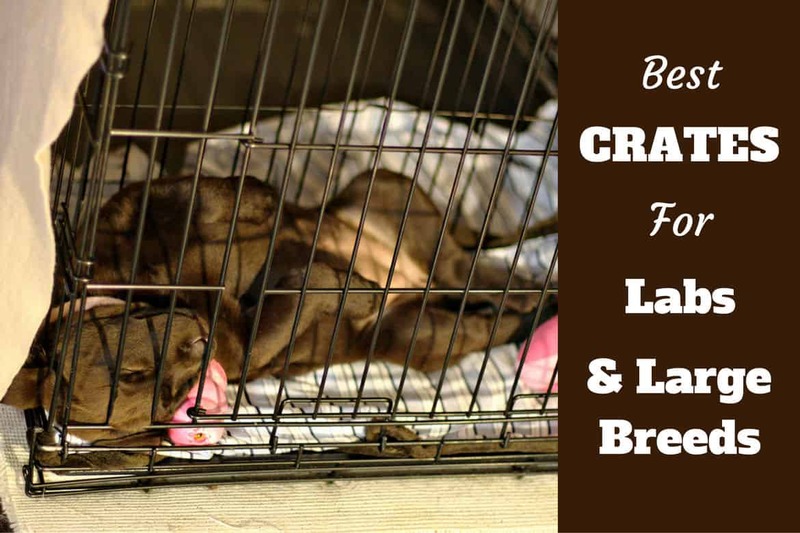 A 24" crate that's perfect for Labrador puppy's or small dogs up to approx. 25 pounds, this crate comes fully assembled for easy set-up and break-down. It also comes with a free crate training guide to follow - though of course we think you'd like to follow ours! 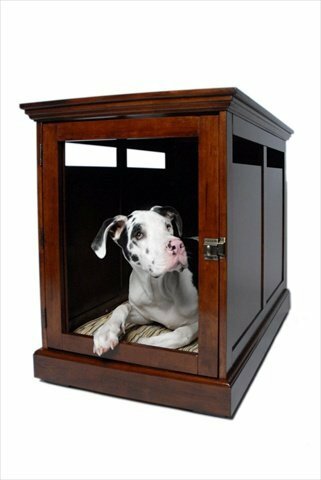 It has two doors allowing greater flexibility for placement up against different walls in your home and easy access for your pooch. It has a removable, easy clean plastic tray so no hard work to keep it clean. A divider panel is included for re-sizing to suit the size of your puppy as they grow. Assembly requires no tools - it couldn't be easier. You can fold this crate with very little effort and it includes a carry handle for ease of portability. It has no sharp edges and rounded corners for the safety of both yourself and your pet. It's finished in a stylish, black epoxy resin that is simple and easy to wipe clean and very durable. Extremely good feedback from previous buyers across the web! At 16 weeks old, a 24" crate that was suitable for a young puppy will now have been outgrown. You're gonna need a bigger crate! A versatile metal dog crate with adjustable divider panel, for easy access there are both side and front doors that can be secured with slide-bolt latches. Rounded corners with your pets safety in mind, easy to set up and to fold down for portability with 2 plastic handles to easily carry it with. Incredibly good feedback and ratings across the web from previous buyers! 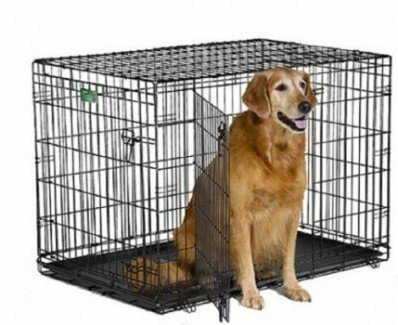 A 42" crate is perfectly suited to a fully grown adult Labrador, though you should measure your dog as for the smallest of Labs, the 36" crates above will often suffice. The same crate I recommended at the start of the article. When so many previous and current owners give such glowing feedback and reviews in so many places where it's for sale on the web, I simply have to agree! It's durable, available with a single side door or, for convenience, with 2 doors front and side, plus a removable tray for cleaning. It's easy to set up and just as easily folded for transportation or storage. Comes with a divider panel making it perfect for Labrador's of all ages. One crate for your dog from puppy to adult. In our opinion, the mix of price, features and quality make this crate almost unbeatable value! 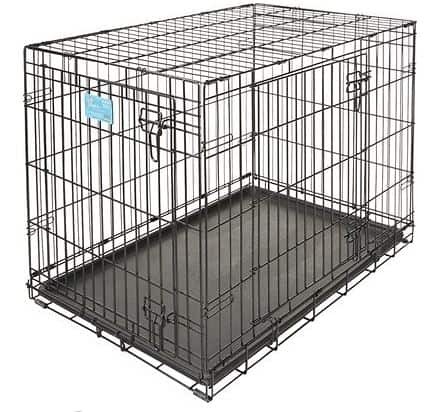 Metal wire dog crates are extremely strong and durable meaning they last a long time. Easy to clean, they fold for storage and portability and are hands down the most economical and practical style of crate you can buy. 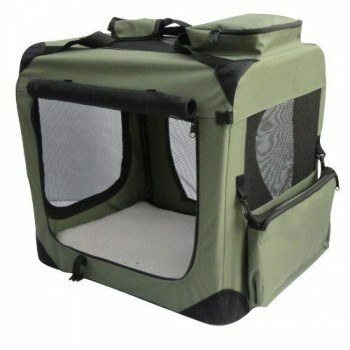 A unique looking crate but popular crate, comes complete with free fleece pad bedding and storage / carry bag included. Constructed with blow-molded, durable plastic with steel inserts with rounded corners to prevent damage to your home or your car. Comes complete with wheels and a handle for easy portability. Very good reviews from current owners, a very popular crate. These soft-sided crates are very easy to put up and take down, very lightweight and extremely portable making them ideal to take camping, fishing, and many other times on your travels. 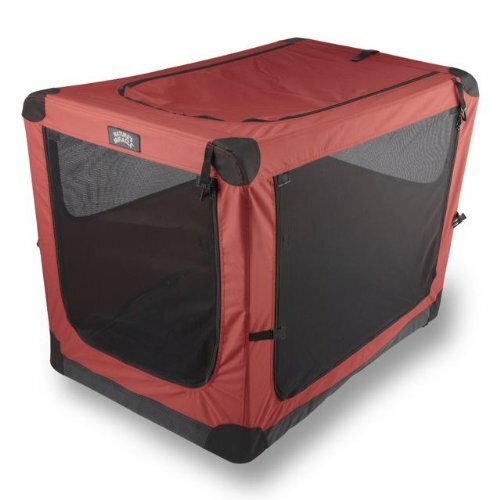 A 42-inch soft-sided crate in maroon and black, made of heavy duty mesh and nylon fabrics, easily set up and folded down in seconds with no tools needed. Mold, mildew and bacteria resistant, stain resistant and with odor-blocking technologies in the fabric. An easy way to provide shelter for your dog when travelling, camping, fishing or wherever you happen to go. Perfect for pets on the go! Size: 42" long x 28" wide x 32" high; 2" wider and 4" higher than most other brand soft crates. Complete with free carrying bag and mat. Easily assembled and taken down in seconds with no need for tools. Top, front and side doors plus two accessory pockets on the top and the side for convenience. Comes with a 100% Money Back customer satisfaction guarantee. 42" long to comfortably accommodate Labradors and similar size breeds. Easy assembly and folds away in mere seconds with no tools required. Comes complete with a carry bag and crate mat free of charge. 3 doors for easy access and two pockets for storing your dogs equipment and accessories. 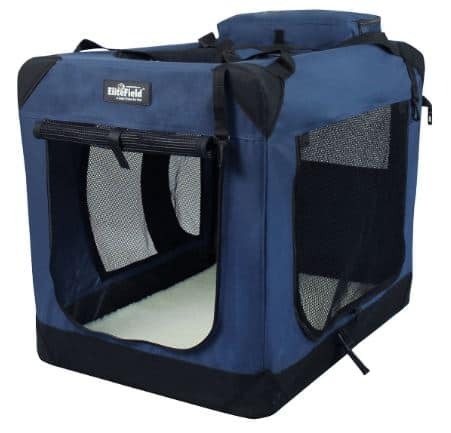 A well-made, highly durable pet crate suited for use both indoors and out. Made with a heavy duty, tight-weave mesh fabric, with top, front and side entry doors. Steel frame with ventilated mesh panels. Set up and break down is easy, in seconds, with 3 quick and simple steps. This was only a small selection of the many options available where I've picked only the best quality crates most popular with the readers of this site. If you haven't seen a fabric crate here to suit your tastes, there are many more styles available and Amazon is the best place to buy with it being so competitive that the sellers all offer large discounts. Airline approved travel crates are essential if you intend to fly with your dog as airlines will not take a pet as cargo in a crate they've not approved. 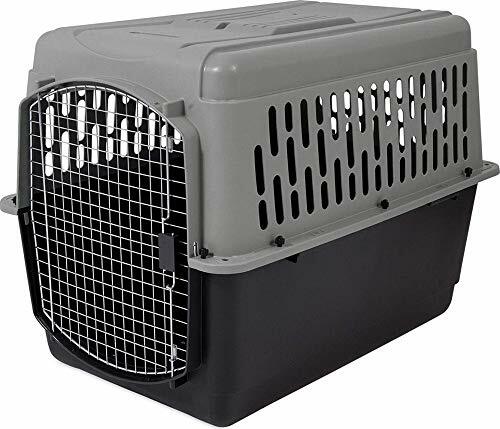 But plastic crates aren't only for air travel, they're also extremely useful for trips to the vet, to safely hold your dog in the car and to take with you on family trips away. Easy to build with assembly taking mere seconds. Dual turn-dial latches for the ultimate ease in securing your pet. 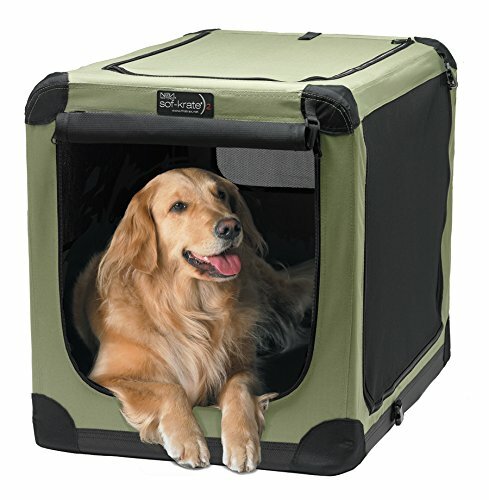 Increased ventilation and large doorway size for the ease of use for your dog. For pets up to 100 pounds and 28" tall. Heavy-duty plastic with wire door and wing nut fastenings. Airline approved and comes with 1-year manufacturer guarantee. I've shown here only the best travel crates offering the greatest value, but of course not everybody has the same tastes as me! 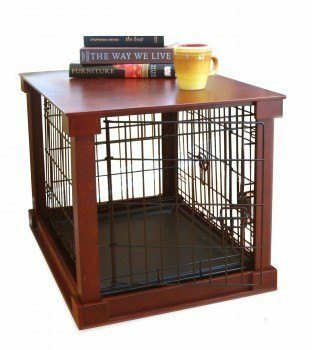 There is some particularly fine pet furniture available, in a variety of finished woods. Comfortable, functional and less an eye sore than a usual wire or plastic crate, some crates can be chosen to fit more aesthetically into the design of your home. With panels covering the main edges and components of the crate, it has a more pleasing finish and looks like a piece of furniture. A dual function item due to a solid top that provides a surface area to place household items without disturbing your dog inside in any way. Has a removable plastic tray for easy cleaning. X-Large size of 42" x 28" x 31" high, for dogs up to 100 pounds. An indoor crate with pleasing looks so you won't want to hide it away. Non-absorbent and complete with a removable plastic tray making cleaning a breeze with soap and water. 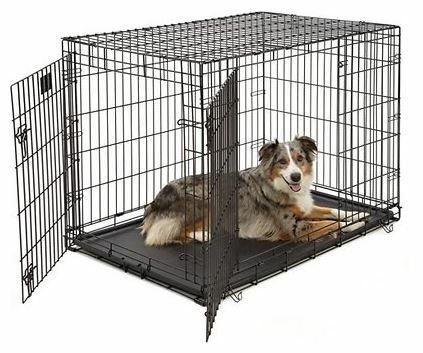 41 x 34 x 26 inches X-large dog crate good for dogs up to 120 pounds. Easy assembly requiring no tools. Multiple coats and sealer protect the wood and the item is finished with antique brass hardware. 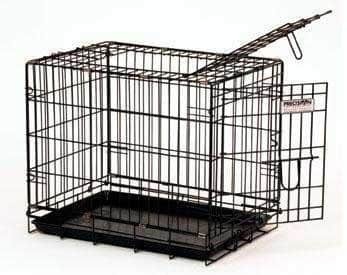 Removable grate providing you with the option to allow your dog to come and go freely, or secure them safely inside. Will look stylish in your home, perfect for use an occasional or telephone table, or perhaps as a surface for a lampshade, vase or other ornament. 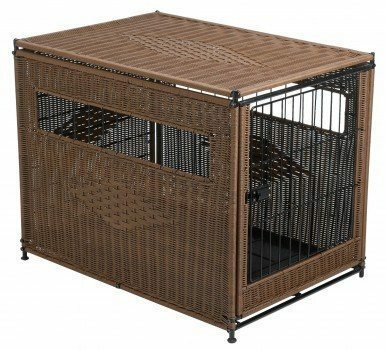 If you're not happy with the look of traditional dog crates, perhaps the stylish look of Mr. Herzhers deluxe pet residence is more fitting? Furniture grade construction with a solid wooden frame and 'Rhino Wicker' panels. Door opens 5 ways or can be removed completely if you'd like your dog to be able to come and go freely. Padded feet to elevate the crate helps to protect your floor underneath and allows for better ventilation. Tough ABS removable tray in the base for easy cleaning. 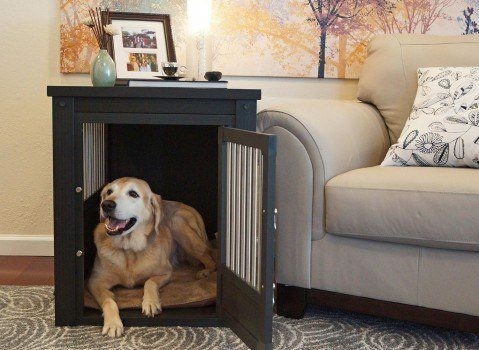 An elegant to provide your dog with a cosy den while disguising the crate as a usable piece of furniture that is a functional end table with a usable surface. Made from a composite mix of recycled polymers known as 'ecoFLEX', with stainless steel spindles. Doesn't adsorb moisture so will remain odor and stain free as well as being very easy to clean. Although I've shown a good selection of furniture style crates here, not all crates will suit the look of all homes and there are many other options available. 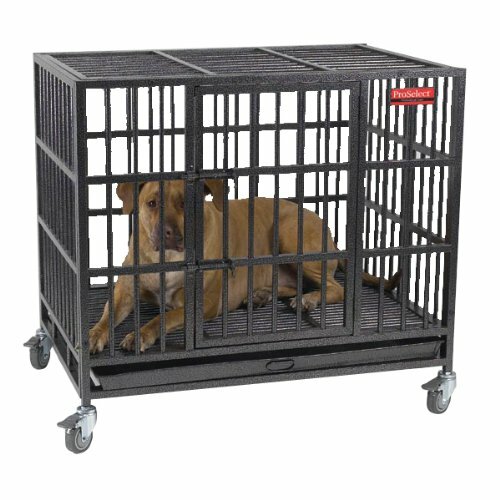 These crates are designed for both very powerful dogs, or owners that want a crate that will literally last a lifetime. A superior quality crate manufactured from the best and most durable materials, this crate is designed to truly last and may be the only crate you ever need. 2-doors, one side and one top. Corrosion resistant floor grate and removable steel tray for easy cleaning. Comes with 4 coasters for easy movement, 2 of which lock so it can be fixed in position. 3 sizes available, 2 of which, the 36-Inch,= and 42-Inch, are perfect for adult Labradors of all sizes. Another crate specifically designed for the owner that wants a crate for life! Made from extremely strong steel-tubing with sliding door latches and strong welding at all stress points. 36-Inch and 42-Inch sizes available, perfect for adult Labradors. Features 4 removable coasters for easy portability or to fix in a single location. This is easily the strongest, most durable and escape proof crate I have ever seen! Once you've decided on the crate you're going to use, it's extremely important to make it a comfortable and happy place for your dog or puppy, otherwise they just won't want to spend much time in there. You definitely need to buy some bedding to place in the crate, and you should also put 2 or more durable chew toys in there to keep them occupied and start a good chew toy habit (learn to chew their toys...and not your belongings!). You can even add a cover to make it even more cozy and comfortable for your dog, often a great addition to help a puppy sleep through the night. You can click here to see our recommendations for what to put in a crate with your dog to make it a comfortable and happy place. First of all: Have your dog stand tall and proud on all fours, then take measurement A, from the base of their tail all the way to the tip of their nose. Notice I said the base of the their tail and not the tip! If you measure to the tip of their tail you will end up with an unnecessarily enormous crate! Now add 12 to 15 cm or 5 to 6 inches to measurement A and the figure you have is the correct length of crate for your dog to be able to comfortably stretch out and turn around without the crate being too large. Secondly: Measure your dog in a sitting position from the floor to the uppermost, tallest point on the top of their head, as seen in the diagram above for measurement B. We measure them in the sitting position because most dogs measure taller when seated in comparison to when standing and we want to make sure they have room not to hit their heads on the ceiling. Now add 12 to 15cm or 5 to 6 inches to measurement B and the figure you arrive at is the perfect height of the crate for your dog. So the complete process is: Take measurements A and B as seen in the diagram, add 12 to 15cm or 5 to 6 inches to both and these are the length and height of the crate that you need. Generally speaking, you only really need to measure the length of your dog, measurement A, and the other dimensions of the crate will be in proportion anyway, but it doesn't hurt to check! FURminator Review 2019-All It’s Cracked Up to Be?